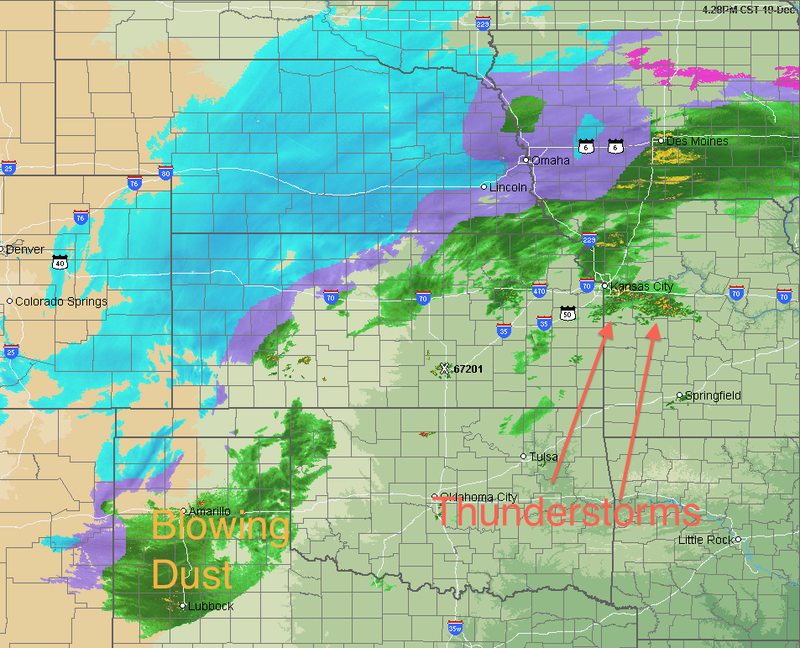 AccuWeather Regional Radar at 4:30pm shows the area of green in the southern High Plains to be the largest cloud of blowing dust I've ever seen on radar. The NWS at Lubbock just sent these comparison shots from yesterday and 4pm today. Gusts of 55-60 mph are common. The first thunderstorms of the day are trying to form near I-70 between Kansas City and Columbia, MO. The blizzard continues to rage with I-70 closed in eastern Colorado. Earlier forecasts (see below) still look good. ADDITION: I-70 now closed from Colby, KS to Denver (5:45pm) Wednesday.